Frederik December 02, 2011 Comment? Alien prequel, Prometheus. 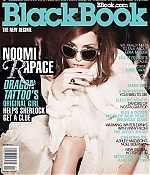 Rapace’s greatest role however, comes this month, when she stars as our brand new cover girl. Believe it. Rapace is lending her feline features to our annual New Regime issue, which is where we do what we do best: Tell you who will be shaping, bending, and defining culture in the year to come (and the years after that, we hope). This year’s portfolio of overachievers includes everyone from The Descendants break-out Shailene Woodley, to Montreal songstress Grimes, to Bushwick-based performance artist Xavier Cha. If you don’t know their names yet, that’s kind of the point. You will. Check out the issue, on newsstands now, and check back to Bbook.com for full coverage.